Emma Watson is an English actress, model, and activist. She is famous for starring as Hermione Granger in the Harry Potter films. Emma was born in Paris, France, to English parents, Chris Watson and Jacqueline Luesby, both lawyers. She lived in Paris until the age of five, before moving to England, living in London and Oxfordshire. She can speak some French. Emma has said that her father was born in Iran, where her paternal grandparents, who were English, spent some time. One of Emma’s paternal great-great-great-grandfathers, Charles William Rudolph Duerre, was German, from Memel, Prussia. Charles was the son of Carl Gottlieb Dürre and Amalie Carolina Schroeder. Emma’s paternal grandfather is Phillip/Philip James Watson (the son of Harry/Harold Kenneth Watson and Gwendoline Elsie Tiller). Phillip was born in Brentford, Middlesex. Harry was the son of Thomas Watson and Ethel Louise Riley. Gwendoline was the daughter of James Tiller and Jennet Down. Emma’s paternal grandmother is Freda E. Duerre (the daughter of Frederic E. Duerre and Susannah Martha Pannell). Freda was born in Lambeth, London. Frederic was the son of Ernest Frederick Duerre and Ellen Emma Soul. Susannah was the daughter of Albert Isaac Pannell and Susannah Sarah Hutchings. Emma’s maternal grandfather is Colin Luesby (the son of Horace Luesby and Edith Speck). Colin was born in Sleaford, Lincolnshire. Horace was the son of John Peake Luesby and Susan Ward. Edith was the daughter of Robert Speck and Fanny Smith. Emma’s maternal grandmother is Greta M. Dickinson (the daughter of John George Dickinson and Winifred Jane Bonsor). Greta was born in Boston, Lincolnshire. John was the son of George Dickinson and Elizabeth Rebecca A. Walton. Winifred was the daughter of William Bonsor and Mary Jane Tanser. Both of Emma’s maternal grandparents were from families that had lived in Lincolnshire for several generations. I thought it’s pretty common knowledge that those dark Brits either have Iberian or possibly even middle eastern/indian admixture from colonial times. Either way original europeans are light skinned with light hair and eyes. Dark eyes and dark brown hair is inherently non european. Obvious give away of their mixed ancestry(and there are a lot of those). Real Brits are Anglo-Saxons, a germanic tribe. “Dark Brits” LOL, such a curious Internet phenomenon. Her physical appearence is absolutely common throughout the British Isles. Also “original Europeans” were definitely darker skinned than modern ones (from what we know) and if you think that “Real Brits” descend just from Anglo-Saxons, well they’re a minority. Pathetic. 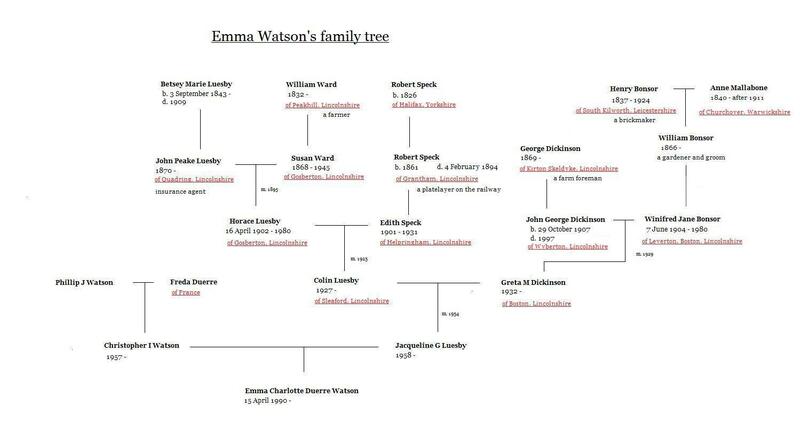 Watson is a Scottish surname, there must be a Scottish grandad somewhere in her tree.